Geek Girls Rule! #172 – Sukiyaki Western Django – Geek Girls Rule!!! OK, I am a huge Takashi Miike fan, but I am the first person to tell you he is not for everyone. 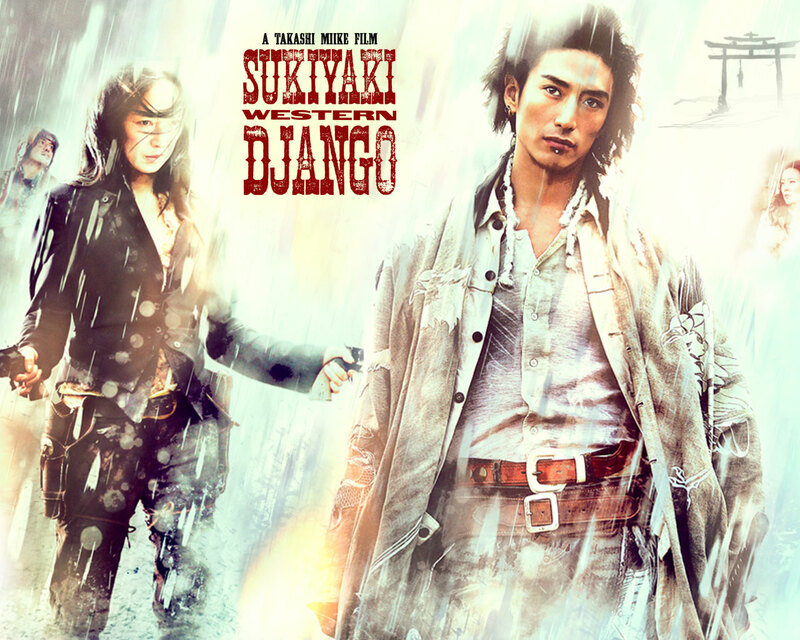 That said, if you have a good stomach for graphic violence, some of it sexual in nature, and you like over the top, bizarre homage films, I highly recommend Sukiyaki Western Django. . This film is Takashi Miike’s homage to the spaghetti western, in particular the film Django , directed by Sergio Corbucci, which is considered the most violent and over the top of the spaghetti westerns. I’m not entirely sure I’ve seen it, but I may have. From the description though, it almost sounds like Takashi Miike toned down the sexual violence of the original. Which is kind of troubling, given we’re talking about the guy who directed the Masters of Horror: Imprint , a paean to lovingly photographed sexual violence, judged too graphic and disturbing to air on Showtime, although it’s been released on DVD and is available on Netflix. I’m almost afraid to watch the original Django now, honestly. The film starts with an almost Noh or Kabuki-like scene, wherein Quentin Tarantino narrates the history of the Genpei War, on which the film is loosely based, as well as being influenced by the War of the Roses, Django, Yojimbo , and the films of Sergio Leone (The Man with No Name Trilogy (A Fistful of Dollars / For a Few Dollars More / The Good, The Bad, and the Ugly) [Blu-ray] ). He pops up as narrator again later. The film features a Man with No Name, and two rival Japanese clans in a Nevada mining town. He comes into town and offers his services to help find the town’s “legendary treasure” to the highest bidder. A bidding war ensues, but before he can choose, an older woman comes to take him away for tea and a meal. She tells him the story of the town, and of her grandson. His father, her son, had been a member of the “red” Heike clan and he married a girl from the “white” Genji clan. Her son Akira* is killed, and his mother nearly raped by other members of the Heike clan, and she seeks refuge with her own clan, where she is raped and kept as a prostitute. The Man with No Name agrees to help her get her revenge, and he incites a war between the clans, culminating in a town clearing shoot out with the Man with No Name and the grandmother, a famous gunfighter in her own right, on one side, and then the other two clans, all facing off. Say what you will, but about Takashi Miike, but the man can frame a shot like no one I’ve ever seen. Yoshitsune’s final charge at the Man with No Name is elegant, just amazing. I reiterate, that this movie is not for people who are uncomfortable with graphic violence. Remember, this is the man who directed Ichi the Killer . While it has less sexualized violence than many of Takashi Miike’s other films, it still has some. He’s also a big fan of comedic violence, and I have to say, the actor who played the Sheriff, Teruyuki Kagawa, is an incredible physical comedian. There’s buckets of blood, some stunning, if not even remotely historically accurate, costumes. The dialogue is all delivered in English, in some cases with nigh incomprehensible Japanese accents. There are little in jokes scattered throughout the film, concerning spaghetti westerns, Yojimbo, Django, Shakespeare and Japanese culture. I’m pretty sure I didn’t catch all of them. The end of this film will come as no surprise to anyone who has ever seen a spaghetti western. But it’s filmed so beautifully. Takashi Miike has a way of making even the ugliest violence beautiful on the screen. *The explanation for his name will crack you up.